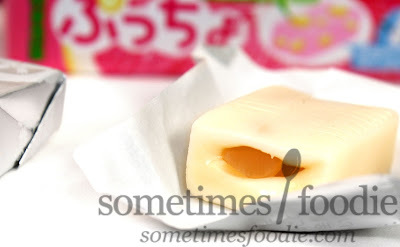 Even though I have reviewed a BUNCH of different Puccho flavors, there is only one other Puccho review here on the site, and it's the Banpeiyu Da Mon Puccho. All the other posts are still in my Tumblr archives, and we both know I'll probably never get around to transferring all those posts over....so let's start fresh with a little information about this candy. 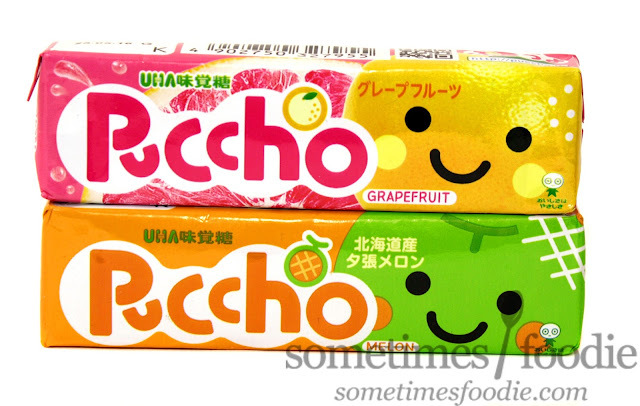 Puccho is a fruit chew candy produced by UHA. 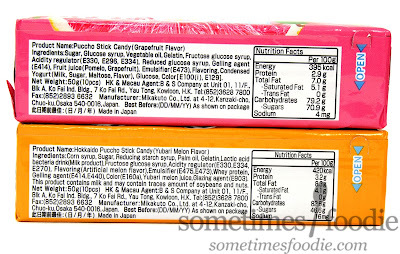 At a glance, the fruit chews look similar to Hi-Chew and many other dense fruit chews from Asia, but this particular variety has some different mix-ins that make it unique. Usually those mix ins are small, stiff, oval-shaped gummy candies with their own unique flavors, but I have had some in the past that used fizzy candy as well. 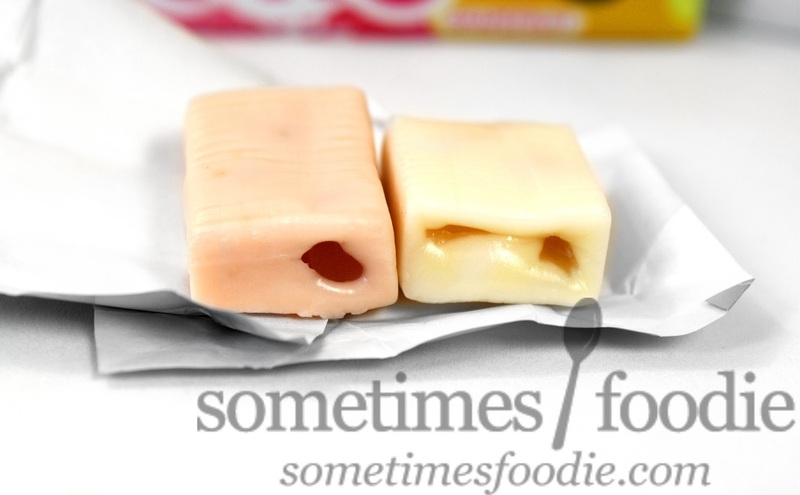 Unlike Starbursts, which are more like a stiff taffy that dissolves as you chew it, Puccho has a denser, bouncier, almost gum-like chew that dissolves more slowly. 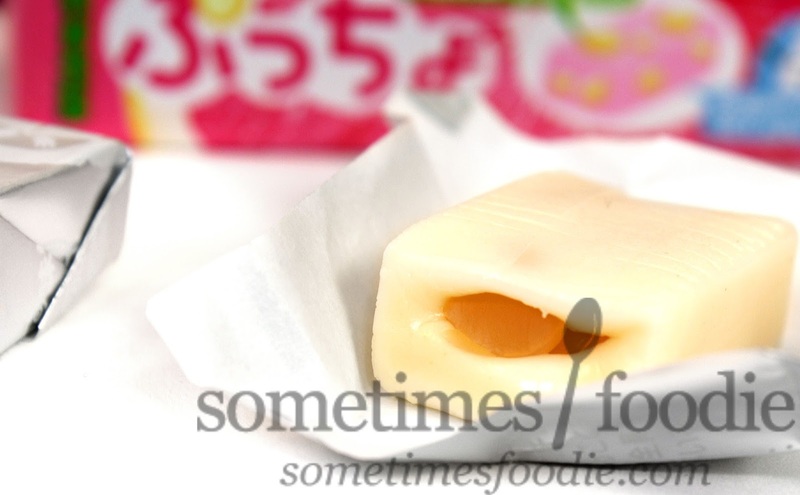 It's a texture I have only experienced in Asian candies, like Hi-Chew, and it's something you really need to experience for yourself to truly appreciate. There are tons of flavors available, pretty much every fruit you can imagine, as well as localized specialty items, cola, ramune, and even a mystery fruits flavor. I've tried every flavor I've come across and even though I do have a few favorites, I have never been disappointed. Will today mark the end of that winning streak? We shall see. This packaging is freaking adorable. We have bright, bold, colors with simple illustrations and all the necessary information. At first both flavors look really similar, but if you take a closer look at the grapefruit variation you can see that the fruity face has some texture to it, and the backdrop features some photo-realistic imagery with some juicy splashes thrown in for good measure. Those little details make it my favorite of the two, but both are really effective at grabbing your attention. As you rotate the packaging you can see that the little faces aren't just disembodied floating heads, they have tiny little bodies! How freaking cute is that? 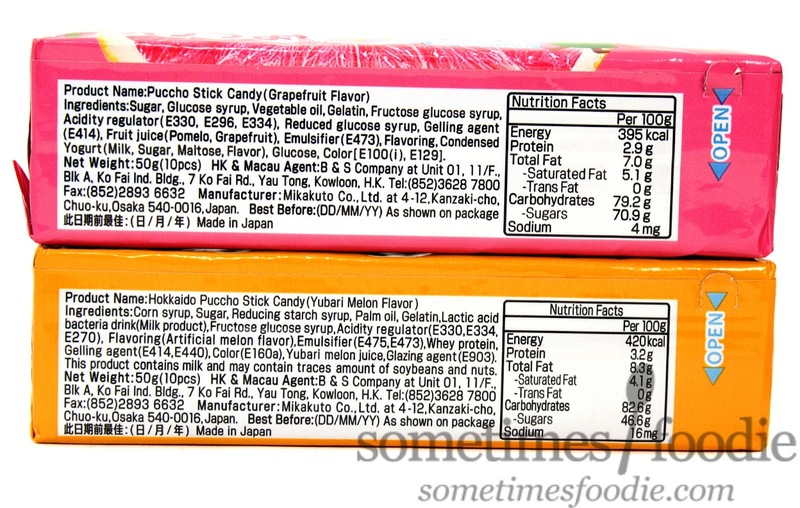 You can also see a more detailed illustration of the candy inside with it's little gummy mix-ins. The illustration does show WAY more mix-ins than I have ever seen in a real chew, and it includes clear descriptions in English. This is something relatively new, back when I first bought these candies everything needed to be translated. I wonder if this is region-specific packaging? Inside, the candies are individually wrapped in silver foil that is covered with cute illustrations of their mascot. In practice, it reminds me of the wrappers from Fruit-Stripe Gum, but (sadly) no temp tattoos here. Grapefruit: Pink chew-base with bright yellow-orange gummy mix-ins, this flavor has dry, tangy, grapefruit flavoring mixed with a mild yogurt-y sweetness. As you chew, the gummy candies let out a bolder citrus-y flavor that is very juicy and authentic, and it really makes my mouth water. Grapefruit is a flavor I wasn't a huge fan of as a kid, because of it's more complex and dry notes, but as an adult, it's really refreshing! I think all grapefruit lovers would greatly enjoy this candy, and the refreshing citrus flavor lingers long after it's gone. This is a great flavor for spring/summer! Melon: The packaging may say "melon" but the illustration and coloring obviously lean towards Cantaloupe and the back of the package clarifies this as a Yabari Melon flavor. Unlike the grapefruit variety, this chew is plain yogurt-flavor, and all the melon-y goodness lies in the gummy inclusions. 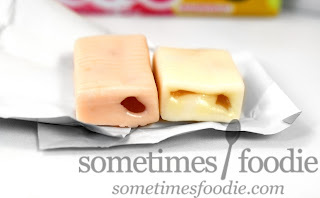 As you chew, a sweet, mild, and almost cheese-y yogurt flavoring starts to build up, and it's interesting...I'm not a huge fan of plain yogurt flavored candies, which are popular outside the USA, but thankfully the gummy mix-ins start giving off some juicy cantaloupe flavoring to save the day. The yogurt-y base gives this particular flavor cheesecake vibes, and I don't know about you guys, but melon flavored cheesecake is not my thing. Of all the Puccho flavors I have ever had, this melon one is the only one I wouldn't re-purchase. If the chew-base was straight-up melon flavored, I'd probably be singing a different tune, but sweet cheesy-yogurt chews are not my thing. That being said, the grapefruit flavor is really spectacular, and I highly recommend giving it a try along with (pretty much) any other flavor they offer!